Yesterday, Jimmy Cuba left the market for ever. He is a widely respected and popular figure who has traded here continuously since 1992, after the fruit & vegetable market left. This Sunday, as Jimmy packed up his stall of Latin & World Music for the last time in Spitalfields, the other traders came over to shake hands and make their regretful farewells. Old friends of Jimmy and a string of musicians had been turning up all through the day to greet the man who has become a legend in the Spitalfields Market. It was an emotional moment, but everyone maintained a dignified composure and let the soulful lyricism of the music express what we were feeling. 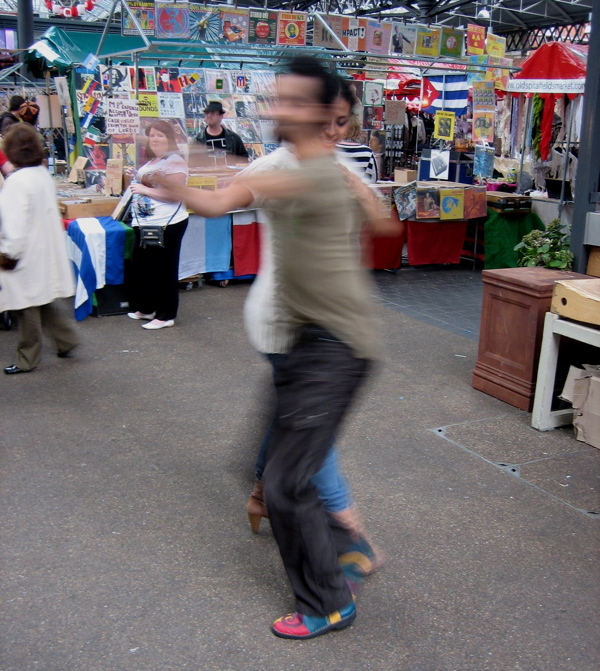 Yet when Jimmy increased the volume and took the rhythm uptempo, a party broke out spontaneously as people submitted to the irresistible Latin beat, with couples dancing in the market. There was a surreal delight to this extraordinary spectacle, which incarnated the passion and idiosyncratic poetry which Jimmy brought to this market that he loved over all these years. We shall miss his mischievous good natured presence, his witty slogans on cardboard signs and, of course, we shall all miss that Latin pulse which has been the soundtrack to market life for the last two decades. We learnt something from Jimmy Cuba, because through his open-hearted manner he constantly reminded us that Spitalfields is more than a marketplace, it is a community of people and an arena for cultural exchange. Months ago, Jimmy summoned me for breakfast to Dino’s Cafe in Commercial St to reveal his sober intention to quit on the last Sunday of trading before the stallholders are temporarily moved out of the market into the street while another event takes their place in the building. It was the last straw for Jimmy who has endured the whims of successive managements in the market over two decades. 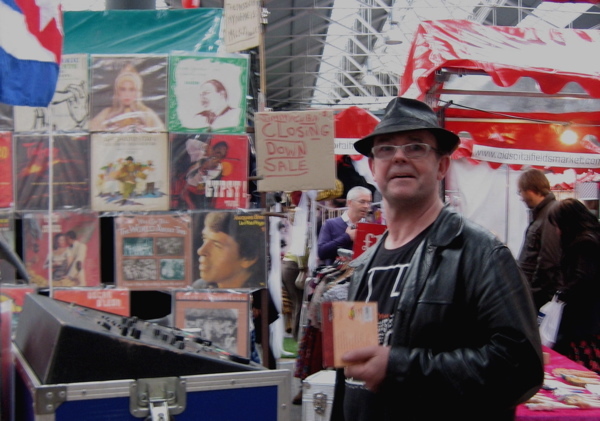 Growing up in Romford Market and beginning trading in music when he sold his record collection in Leather Lane thirty years ago, Jimmy has a strong feeling for markets as a collective human enterprise. He understands the drama of chaos and banter that brings the best markets alive. With an inborn sense of levity, Jimmy is an unrepentant free agent who is never afraid to speak his mind. An innately decent person, he has a personal sense of justice that has led him to stand up for the traders on innumerable occasions over the years. And the corporate style of the new management – with executives who stick to their offices and will not even make eye contact with traders when they walk through the market – was too much for Jimmy. They did not like his cardboard signs, they thought his music was too loud and they did not like his attitude. Jimmy rolled his eyes in outrage to recount a recent incident when the traders arrived to set up their stalls in the morning, only to discover that the management had “forgotten” to tell them there was a promotional event happening, and they were sent away, losing a day’s income. “The market management, they only care about making money and they don’t see people, they are just interested in pounds per square foot. Spitalfields Market had so much more than that, but it’s been sanitised,” he admitted to me reluctantly on Sunday, as if it hurt to speak this way of a place that meant so much to him. “I’m going to buy a boat and live on it for half the year,” continued Jimmy, looking to the future with brave confidence, “And I’m going to get back into DJing.” Because, as everyone who knows Jimmy Cuba is aware, he has become friends with many of the legendary performers of Latin Music, creating a mutual respect that has led to some dropping in on his stall in Spitalfields when they come through London. “I’m going to be spending a lot of time in the States because that’s where the artists are going to be.” explained Jimmy with a sprightly grin, looking forward to being able to travel once he is not stalling out every week, and can spend more time pursuing his three passions, boating, fishing and Latin Music. 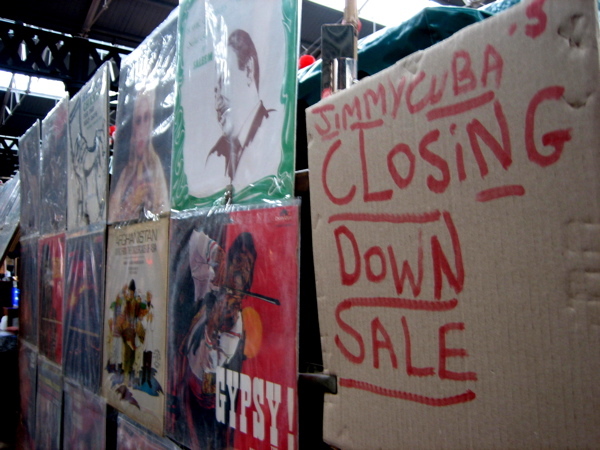 Jimmy Cuba packed up his stall in the Spitalfields Market for the last time on Sunday. 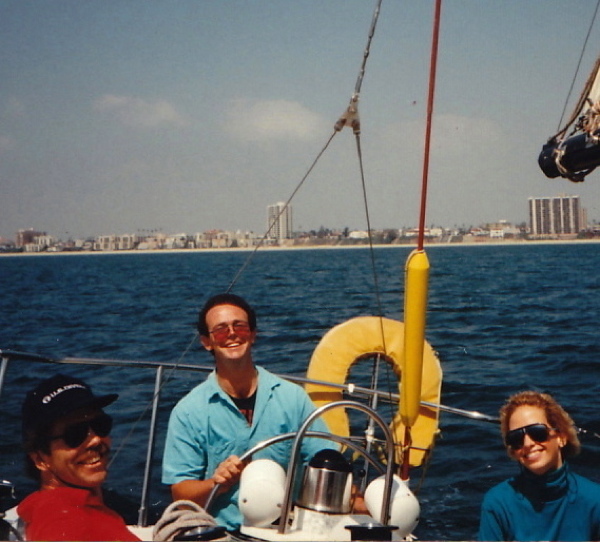 Off Long Beach, California, 1986. An image from the past that gives a vision of Jimmy’s future. 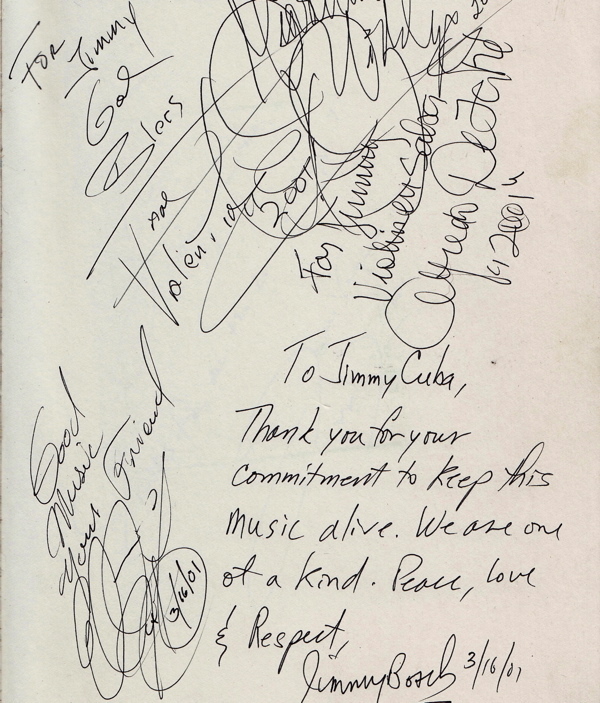 Jimmy’s copy of “Tito Puente & the Making of Latin Music” autographed by Jose Alberto, Giovanni Hildalgo, Davie Valentine, Alfredo de la Fe and Jimmy Bosch – all legends of Latin Music. 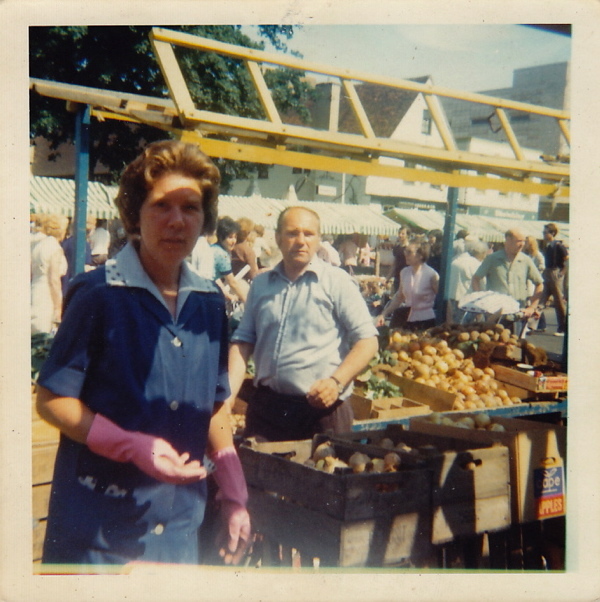 Teddy Manhood & his wife at Romford Market, 1974. Jimmy worked on their stall from the age of twelve and Teddy, who became a second father to Jimmy, used to bring him up to Spitalfields to buy stock. He is leaving the market for reasons that illustrate all that is wrong with modern business and business manners; but maybe the tide of boorish greed is turning…? Goodbye & goodluck Jimmy, I too left Spitalfields Market less ceremonially 2weeks ago after trading there since the year 2000,for the same reasons so meaningfully expressed by you. I had possibly one of the best costume jewellery stalls in London, from Camden Passage, to Camden Lock to Spitalfields over the last 37 years, from vintage to craft to punk to grunge to ethnic and back to retro vintage, been there ,done that. I admire the current innovative traders who can hold their own ,hopefully as creatively as possible,against the new phillistine onslaught. I will enjoy visiting friends and colleagues on my wonderful free sundays. I can now be found in the once derelict, now locally run Broadway Market on Saturdays . I wish that the dream could come true that everyone’s local market could turn around like Broadway so creative people could make their crust within walking distance in the traditional way. Souless. Heartless. Corporate. Dead. Congratulations to the market management on making the Horner building a grey shadow of it’s former lively self. A few weeks ago I was asked by a pair of Spanish tourists standing the in the Old Spitalfields Market where the Old Spitalfields Market was. Good question. …I haven’t managed to get to Spitalfields for a while now but absolutely loved talking to him and of course buying his music. I got some amazing stuff from him and some of it he even gave me for free, just to illustrate he wasn’t all about taking people’s money. This guy has influenced my music collection no end introducing me to things I probably would’ve looked over. I shall certainly miss him as for me, it was the only reason to go to Spitalfields – he did tell me a few years ago how he wanted to get into making compilation downloads. In the hope that he reads this, please get in touch and let’s talk!! This is just another sad example of how the “new ‘old spitalfields market’ is slowly but steadily sucking the life blood out of this truly historic and wonderful place. Why are unnecessary shiny commercial events taking the place of actual spitalfieldslife? I am livid. The Wellington Market Company Plc has decided to rip the heart of this historic , friendly and loving community out and temporally rehouse it in pop up soulless tent down the road. How dare they! When will it end? I started this comment with sadness, which led anger (pitchfork wielding anger) , and now I am resolved to action! This is madness – A market association must be formed and traders must stand up, step up and claim their market back.The time is now people! I’ve known Jimmy Cuba and his passion – for life, music and people – for more than two decades. I met him in the United States in Long Beach, CA and also had the opportunity to visit him in his element – Spitalfields Market. I love Jimmy like a brother. He’s the kind of person to whom devotion and respect really mean something. I couldn’t ask for a better friend. I believe there will be a hole in the soul of Spitalfields Market, where Jimmy and his music used to play. I imagine leaving has left a bit of a hollow in Jimmy’s heart, too. Jimmy, I hope that the serenity of the sea and a new life spinning the music of those you love for those you love assuage any ache in your generous, open heart. There’s a spot waiting for you here in Oakland mate. Like Covent Garden market, where I think I probably first met you in the mid Eighties, Spitalfields market changes again and sadly not for the better…………. Thank for all your support and the great music over the years, it aint gonna be the same. Best from the Nasha records family 2010. A sad day. 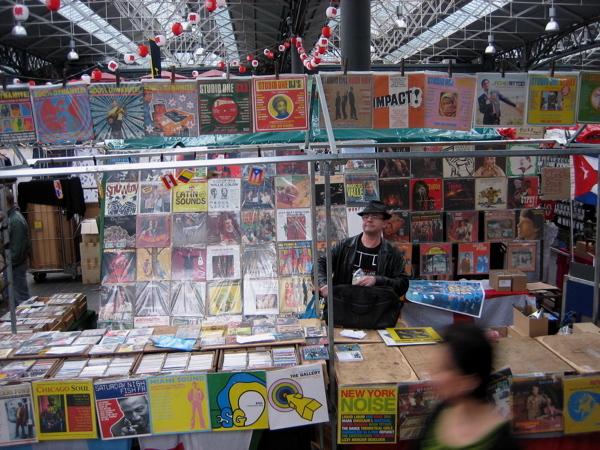 What will it be like at Spitalfields without Jim Cuba and the whole vibe he brings to the market. I could spend hours checking out his assortment of fine and rare discs. Keep it real Jim and enjoy yourself. See you in New Orleans some day. CIAO JIMMY, i use to come from Rome just to buy and listen your soul and your magic way of recomend music.he came in rome to be the DJ for my wedding and people still talking about you ,thank you and remember MUSIC IS FOR EVERYONE . So long Jimmy. All good things come to an end. Good luck with the next chapter ! Sad to see this iconic, charming London landmark destroyed – no not you Jimmy – Spitalfields Market. Once the fruit left some very imaginative people turned the place into a lively space which felt local and retained an authentic market feel not to mention passionately valuing it’s historical significance. Now it’s just a mall and the glittery corporate offices on top of it truly symbolise the crushing of Independent Spirit underfoot – a spirit well represented by Jimmy and his stylish delight in the Latin vibe. Ah well – they did try to fight back but those big guns are just that – BIG. And not for the first time – Covent Garden folks – YUK. Best of Luck – you won’t need it – if ever there was a survivor it’s you. Ravi and I are so sorry to see this. Jimmy did the world music for our wedding in 2003 and we all danced the night away to his great sounds. His experience and knowledge was second to none. The hideous corporate stamp is creeping in everywhere. Jimmy is the best in the business. He has knowledge of the those special tracks that are so hard to find. After a while he gets to give you what you want, even before you ask for it. He is a big loss not only to the market, but to music lovers who are looking for that bit of speciality. Good luck Cuba. 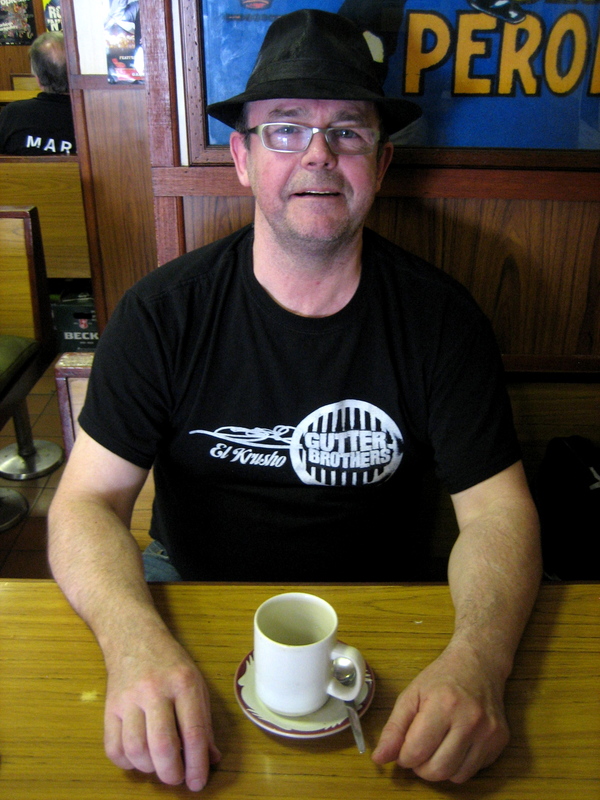 Very sad to hear that Jimmy has left the market, he has been a strong supporter of a number of bands in the UK and abroad for many years, something that has always been enormously appreciated by everyone in the music community. The very best of luck Jimmy, hope to see you soon! The end of an era. Spitalfields won’t be the same. PS if anyone is interested, check out http://www.kingsalsa.co.uk or http://www.weaverecords.com – new album just been released by 13-piece London latin band on a small independent label…..was hoping Jimmy might have been interested in it for his stall…….damn. Sad but sweet congratulations to you Jimmy. Honestly, when I saw the email from Melkerson (Goodby Jimmy Cuba) I thought the worst. So even though your sweet scene there is ending, I’m breathing a happy sigh that you’re safe and sound. I love you and I’m glad you’re part of the world. You’re a good soul. Whenever you get to So Cal let’s get together. Things have changed here for the better. Hope the same for you Amigo. Tonight me & a pal are playing a tiny bar in Long Beach. I’ll think of you and be glad for what’s in your future. Imagine my surprise at discovering Jummy Cuba’s shop now located down an alleyway off Hart Lane in Henley-on-Thames recently. A splattering of jukeboxes and all those great vinyl covers adorn the walls of his small shop. Whether he’s trading in the right place remains to be seen and think somewhere like Camden would suit him better but Jimmy is still that happy go lucky chap as he always has been so if your in the area, do pop in and say hello.